(CAHAWBA, ALABAMA) – Almost exactly 150 years after the first shots of the Civil War were fired, another wave of volunteers is about to descend on America’s storied battlegrounds – only this array of dedicated men and women will be armed with paint brushes, trash bags and weed whackers. On Saturday, April 2, 2011, history buffs and preservationists from around the country will team up with the Civil War Trust to help clean and restore America’s priceless battlefields, cemeteries and shrines. The nationwide effort – dubbed Park Day – is underwritten with a grant from History™, formerly The History Channel, and has been endorsed by Take Pride in America, a division of the U.S. Department of the Interior. 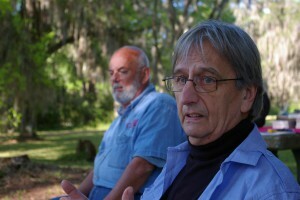 OLD CAHAWBA WILL PARTICIPATE IN PARK DAY APRIL 2, 2011. At Cahawba, one volunteer, novelist David Rothstein, a former University of Alabama professor, is flying in from Oregon to reward the others with a fascinating sneak peek into his new novel, Casualties, which was inspired by and largely set in the very site they are working to preserve. This will be a unique opportunity to bring Cahawba to life as it was in the Civil War through a discussion and readings from the novel and tours by park staff. And if you participate in the clean up you’ll feel especially close to this special place. Volunteers will help clean brush and debris from the site of a Civil War prison. You should bring your own gloves, sturdy boots or shoes, and yard tools. And don’t forget to bring your lunch etc. Copies of the novel are on sale at the Park Visitors Center store. David will be pleased to sign copies and all store profits will benefit Old Cahawba. For more information about Park Day at Old Cahawba, please contact Linda Derry, Site Director, Old Cahawba by phone at 334-875-2579 or by email at cahawba@bellsouth.net. WHEN: April 2, 2011, beginning at 9:00 AM. WHERE: Old Cahawba Archaeological Park, 9518 Cahaba Road, Orrville (Near Selma), Alabama.